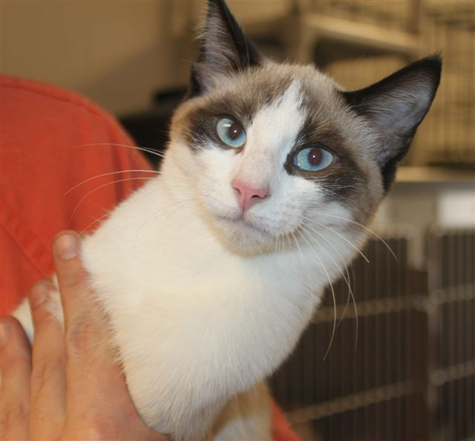 Not on My Watch: Snowshoe Sisters-Saved! 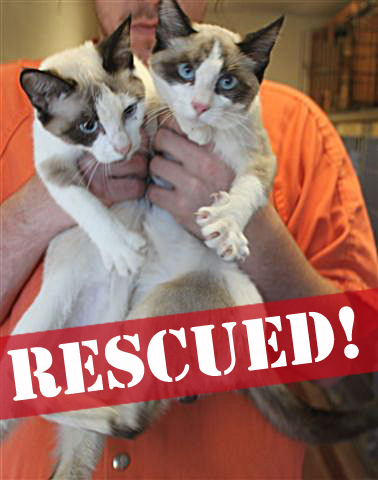 Home > Not on My Watch: Snowshoe Sisters-Saved! I do not like to pick and choose who I rescue because I know whoever I say yes to, means others don't get a rescue and may not live. It makes me sick that I have to be faced with this choice. 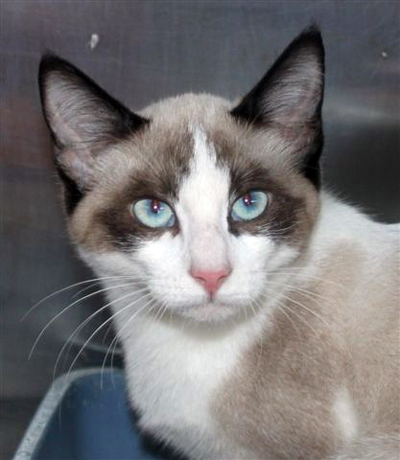 If I choose cats I feel are very adoptable, then they get adopted quickly and make room to save more, though sometimes I just have to save ones like Nigel and Basil , who had no hope of survival, but weren't any less deserving. Today I chose ID#9/26-3728 and 3729, two Snowshoe sisters. I thought they were well into adulthood, but it turns out they are just 7-8 months old. They have fleas. Of course, they're not spayed. I don't know where they came from, but they are sweet, so they knew life with a family, at least for awhile. I don't know if there is a little girl, crying somewhere, missing her kitties because her parents couldn't afford their care or if some cruel so-and-so didn't like them any more because they weren't cute little kittens and dumped them at the shelter two days ago. I just know they needed help. They are named Sally and Clare. They are getting all their vaccines and they already tested negative/negative for FeLV and FIV+. They are getting spayed, too. It will be a BIG day for them, but after that they go to their Aunt Bobbie's house to rest and recover. Bobbie took in Phil, Nigel and Basil, MacGruber and others. She is a great foster mom and I was very glad she could offer her home to help these cats. ©2011 Betsy Merchant. Clare is ready to be busted out of her cage now! My sister-shelter, Animals in Distress, offered them a place to live once they are ready to leave Georgia. I have a feeling they won't be in the shelter for very long-these cats are, I'm told, very sweet and cute. It feels good to know they're safe, but there's a bittersweet quality to this small success. Right now the girls are being prepped to be spayed thanks to the great work Doc Thomas does at Noahs Ark . Thanks to Bobby, for running to get them with no notice, for paying their bill for now and even for prepping them for surgery. Without these good people, this rescue would not have happened. ©2011 Betsy Merchant. Silly siamese sisters! I hate that I can't do more. I left behind all the others who I posted about this morning. I pray people find it in their heart to step forward and help these other cats. It's just so wrong that so many will die for no good reason. There has to be a way to do more. I just have to find a way. Thank you Robin, for saving these little sister babies. Aww what a lovely pair of sisters! I think your right - They would not last long at the shelter! 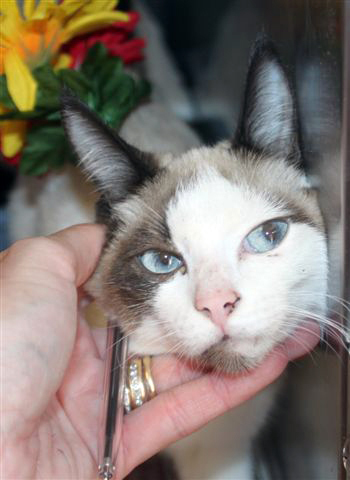 These aren't siamese mix sisters - They're "Snowshoe" cats. VERY adoptable and gorgeous! but I didn't really know what that was. Thanks for the info! We will make sure they get listed properly! What a sweet pair. Oh how I wish they will go together. Thanks for saving these darlings. I hope they'll be able to be adopted together. I'm so glad you pulled these two, they're gorgeous. I'd also like to point out that they look like a Pair of Snowshoes. They're in wonderful hands with Bobbie. I know she'll enjoy having them for however long they stay. Robin, congratulations to your fight for the kittehs... here in Brazil is most diffult than others countries because the people is not educated to animal protection!! !